There are successful bloggers who exclusively write all of the content on their blogs however the vast majority of the top blogs on the web have a number of writers producing content for them on a regular basis. When you manage a multi author blog you spend less of your time writing articles and more time reviewing articles, scheduling articles and managing authors. Today we would like to show you 25 WordPress plugins that will help you run a multi-author site quicker and more efficiently. The list includes plugins that help you manage your staff and plugins that make the posting process better for you and for your authors. It’s important for authors to get credit for the work that they do therefore several author profile plugins that let you increase an authors presence on your articles have also been included in the list. *As always, all plugins have been tested for the purpose of this article. The following plugins will help you manage and communicate with your staff more efficiently. Adminimize is a powerful free plugin that lets you control who has power over every aspect of your website. You can deactivate every possible option you can think of and control what admin, editors, authors, contributors and subscribers can do. The plugin automatically recognises any new user groups you have created too. In short, it gives you complete control over what every user on your site can and cannot do. It works well with a number of other popular plugins too and is updated fairly regularly. A large percentage of blog owners won’t need the extended functionality that Adminimize provides. WordPress does not allow contributors to upload images so it’s a useful way of adding this functionality easily (if not, it’s a pain for guest posters to add images to posts). 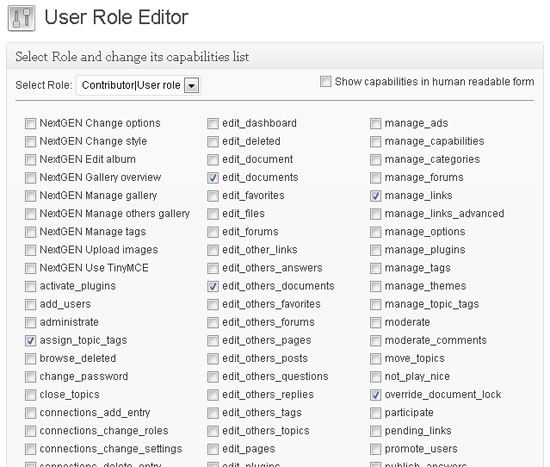 In short, User Role Editor allows you to control exactly what each user group can and cannot do. 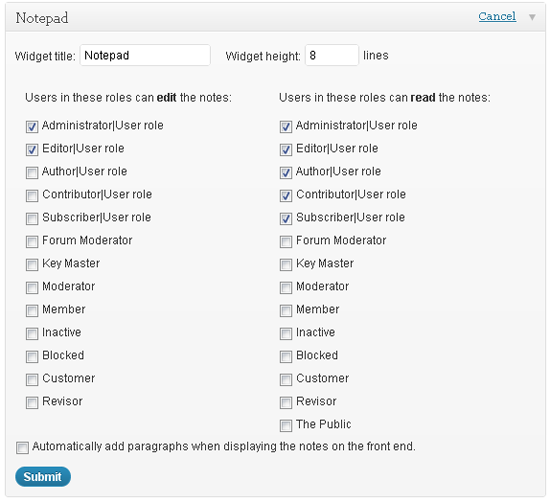 Like User Role Editor, the Members WordPress plugin features a useful role manager that allows you to modify what certain user groups can and cannot do. The plugin lets you control who can see content using shortcodes. By using this feature you can post secret messages to authors and staff or create private informational pages for them (everyone else will see a blank page). What sets Dashboard Notepad apart from other notepad plugins is the ability to configure who can read the notes and who can edit them. It’s a useful way of communicating with your staff and leaving notes for yourself for future articles. If you are looking for a more direct way of liaising with your staff, you may want to consider Private Messages For WordPress. 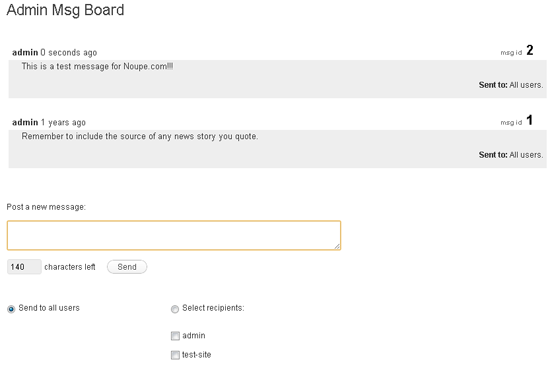 The plugin allows user groups the ability of messaging each other. 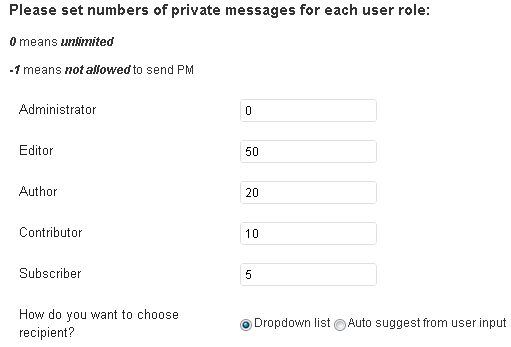 You can set the number of messages each user group is allowed in their inbox. 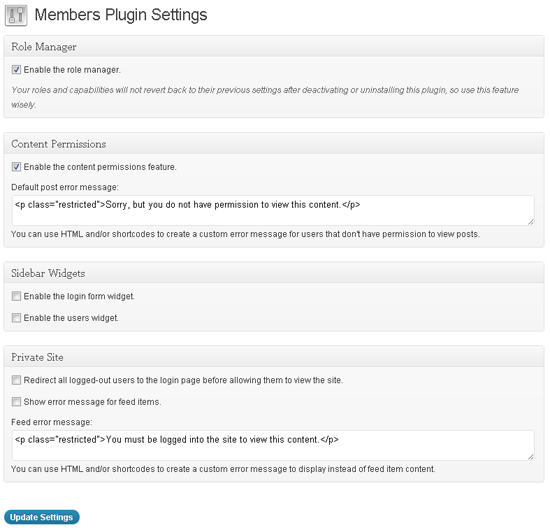 By setting the number of messages for a given user group to -1 you can remove their ability to send messages. Therefore, to create a private messaging option for editors only, you just have to remove the option for authors, contributors and subscribers. Adds a private discussion area that all admins can view and add to. For some strange reason the plugin mimics Twitter and restricts messages to 140 characters or less. A useful plugin that lets you add notes for authors on the sidebar or below the post area. 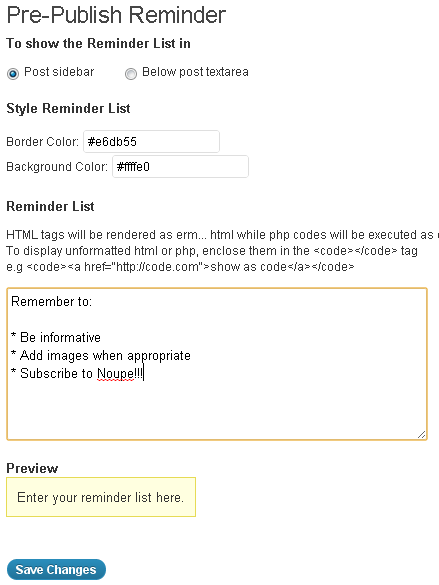 For example, you could remind them of formatting rules or remind them to always add a featured image. Handy if you have staff members who keep forgetting important elements of your posting rules. 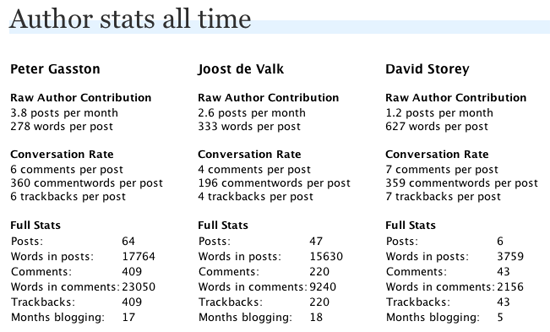 Yoasts Blog Metrics makes it easy to monitor exactly what sort of contribution each author is making to your website. The plugins shows the average number of posts per month, average number of words per post, average number of comments and average number of words in the comments. It’s a useful way of gauging the value of each of your authors. The following plugins improve the procedure of posting in some way for you and/or your staff. 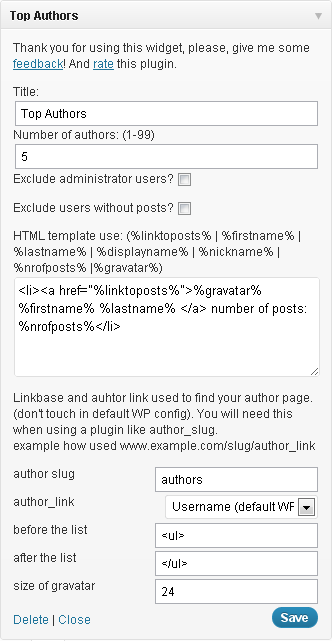 A simple yet useful little plugin that lets you assign more than one author to a post or page. 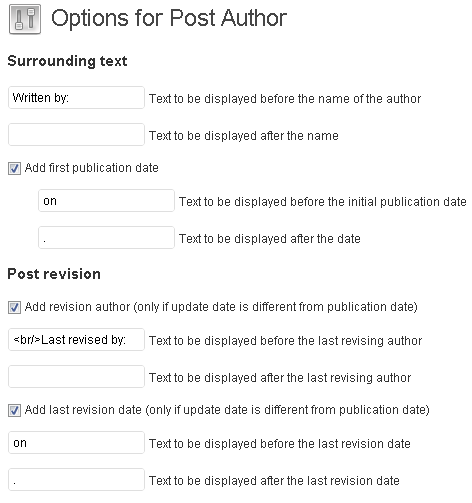 Handy for blog owners who publish a lot of collaborative posts. 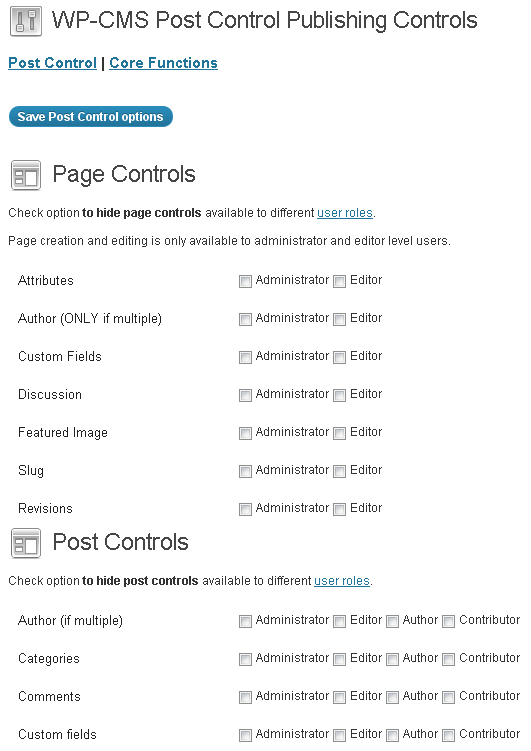 Lets you remove certain controls of the post editor area from certain user groups. For example, for contributors you can remove the ability to set the post slug or featured image for any articles they submit. 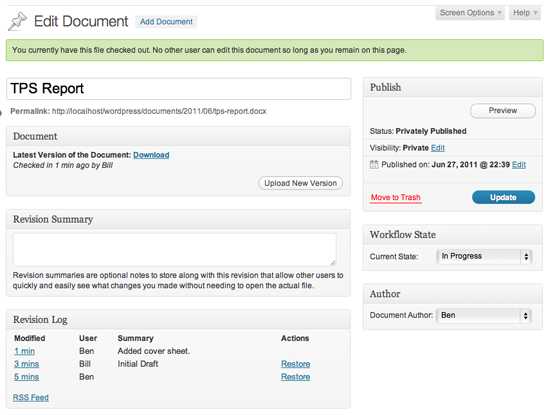 A collaborative document and file system that multi-author blogs should find useful. Users can create and modify documents through the admin area and leave notes for others to advise them what they have updated in the article. This could be particularly useful if you are working on an eBook or preparing fresh content for a new area of your site. Could also be used as a FAQ or Wiki system for staff. Audit Trail allows you to track the actions of your all users (including admin). It shows you when a user last logged in, their IP address and the article they were working on. The ‘Trail’ allows you to see who has been working online via your site on a given day and see exactly what they did. Editorial Calendar makes scheduling articles a breeze with its easy to use drag and drop interface. 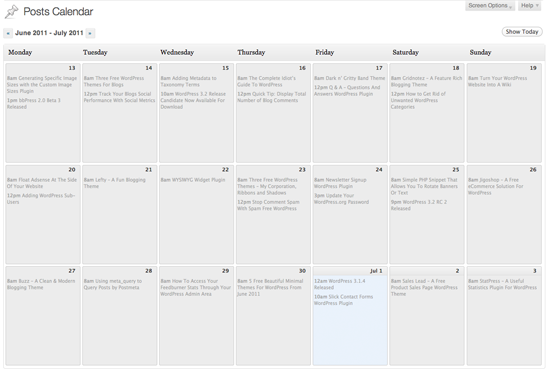 The plugin creates a new calendar page therefore you can still use the traditional posts index page when you want. 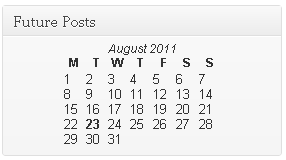 Adds a simple calendar into the top of your post editor sidebar that shows dates of upcoming articles. 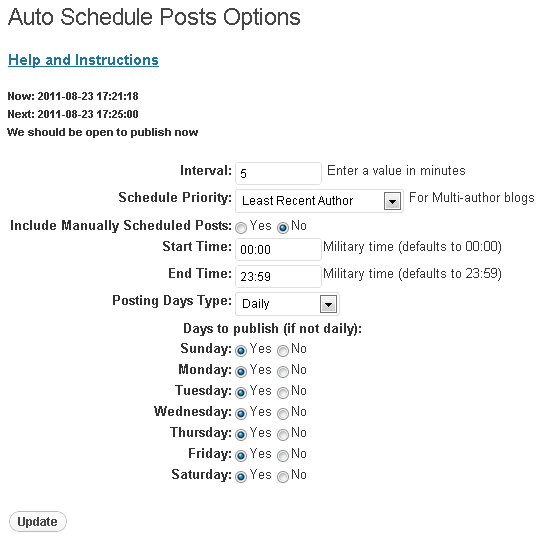 You can also add the calendar to your WordPress admin dashboard. If the publication date of your articles isn’t that important for your website (e.g. a dating website may not be concerned about whether an article publishes today or three weeks from now), then you should find Auto Schedule Posts incredibly useful. The plugin lets you set certain parameters about when you want your articles to publish every week. It will then schedule articles for any days that don’t already have a post scheduled. Adds a productive box underneath your post editor that allows you to search the web for blogs, images, videos, news, Wikipedia articles and more. Authors can then insert or link to the items they find. If your authors are writing articles for you every day they should find the plugin saves them a lot of time. Authors are a vital part of every blogs success, therefore it’s only fair that they get some credit for their work. Noupe, for example, clearly displays the authors name at the top of an article and includes a bio box at the bottom of every article too. The following plugins will give your authors more exposure and let your readers get to know them better. Arguably the best looking author bio plugin available for WordPress, WP Biographia gives you complete control over what is shown in the bio area and adds Facebook, Twitter, LinkedIn and Google+ profile fields to every users profile. You can choose whether the box is shown on posts, pages, archives and/or the home page and you can customise the colour scheme and border too. Without a doubt the plugins best feature is the ability to display author bios in the RSS feed. 99% of blogs don’t include a link to the authors posts or website through their RSS feed therefore the guest poster loses a lot of potential traffic from RSS readers. WP Biographia corrects this by displaying a beautiful looking bio at the end of every post in the RSS feed. A highly configurable top authors widget that lets you list your most frequent authors using their username, avatar or both. You can exclude admin and authors without posts if required. Let authors choose from a pre-defined list of images for their profile avatar. Images can be inserted automatically or manually into posts. Allow a user to assign a photo to their profile for use in posts and comments. 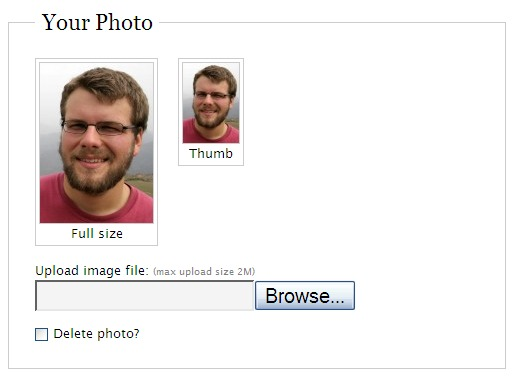 You can set the dimensions for the photo and the JPEG compression level via the admin area. Adds an author information box above or below your content. Post revisions can be shown and an avatar can be added to the bio box too. A simple plugin that automatically adds a cool looking author bio box underneath your posts and pages. Once installed an author box will appear when someone clicks on the link of an author. The box shows the authors name, email address and website. It also links to their Gravatar image, and shows a short bio for the author with links to the author’s other posts. Lets you set aside a percentage of advertising space to be shared amongst authors on your website. It supports any advertising program such as Google Adsense, Yahoo Publisher etc. Authors need to input their publisher ID in order to take part in the program (you can determine what user groups can take part in the program). In order to install the plugin properly you will need to create the table manually via phpMyAdmin (the code is provided via the admin area). 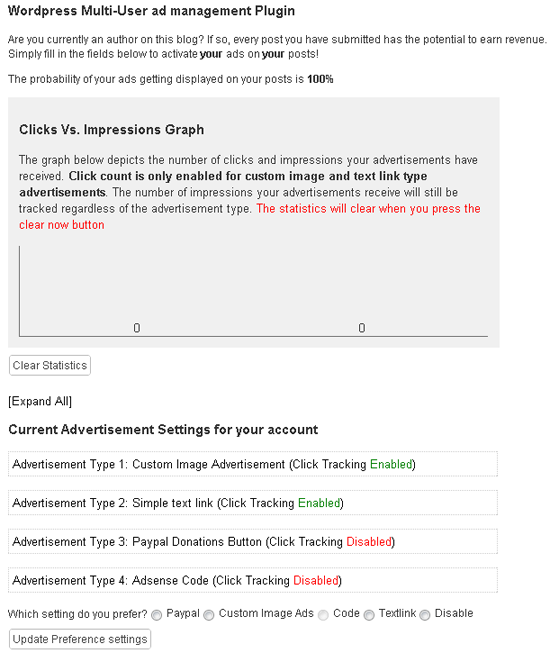 Allows authors to have control over the advertisements that are displayed on their own posts. Custom banners, text links, PayPal donations and Google Adsense are all supported. If you don’t set things up correctly for your authors, you may find yourself in a position where you are spending more time managing authors and correcting their mistakes than you would if you wrote the articles yourself. By automating as many aspects of the moderating process and making things easier for your staff you can save both you and them a lot of time. It’s a profile plugin for WordPress that allows you to customize your website by adding front-end registration, profile and login forms together with extra fields. I’m doing a post soon about thematic so will mention your themes too. Impressive list of plugins you published. Congratulations and well documented complete article. Thanks! Very usefull list of plugin, just in time when I’m dealing with this kind of problem, nice !! Good find Stéphanie. I’m surprised I never came across that plugin when researching for the article as it looks really good. Would be perfect for larger blogs who employ editors etc. Great compilation of handy tools! Now this is a useful list of tools. Thanks for the post! really nice and very useful for my new blog. 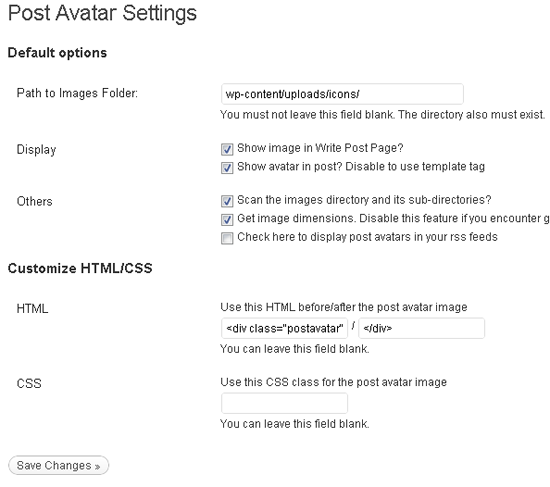 This will be very helpful for I am setting up a wordpress blog for my site. Thank you! Great suggestion. I’ve made a note to look into the plugin in more detail soon. Some plugins are really commendable. Among all the above mentioned plugins ‘WP Biographia’ is the best. It exactly offers what I was looking for from quite some time – author info in rss feeds. Thanks for the excellent article. I absolutely had no idea about such marvelous plugins! I would soon be switching to WordPress, and have already bookmarked this page for installing these plugins. This is perfect! I *just* created a group blog of over 40 contributors and this will take the legwork out of all the admin stuff! Thanks again! Fabulous list. I’ve found quite a few that I might implement. Out of curiosity, have you found any useful plug-ins for posting random ads on sites? I’ve found one, but I would love to know if there are others out there. I don’t think I’m 100% sure what you are looking for but I don’t believe I have come across anything like that as yet. I really appreciate such an informational and helpful compilation of plug-ins! Your descriptions are very helpful and will make selecting and adding these plug-ins so much easier. I wish all plug-ins were so easily explained! Thanks! Great set of plugins, have used most ones on a just finished website..
Hi, thanks for this great collection. I wish I found it earlier. Do you know a possibility to remove the “empty trash” function from all under admin? thanks for this great collection?I love this! GREAT POSTING- now i manage a blog which has many authors – and this posting REALY HELP me.. I am looking for a plugin that will allow me to create a ‘blog’ page on our website that will only pull one authors post. The general blog pulls all author post. Does anyone know of something that may help? Thank you. Thanks, for this wonderful list of plugins. Wow, amazing and very usefull post about multi authors blogs, i have my own blog and i want to setup multi authors. after reading your post, i have got plugins. Is there a wp plugins that allow multiple authors contributing to a site to display their own adsense? I want each authors to able to display their own adsense on posts they contribute. 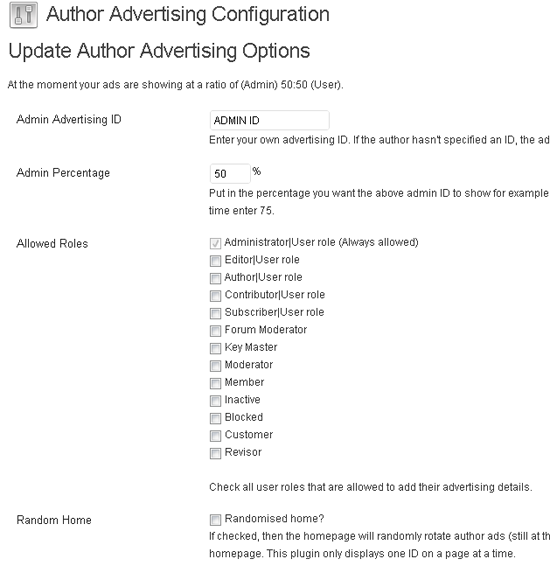 I’ve tried Author advertising and Multiple ad Management plugins but can’t really make good use of them. I like that the Members plugin allows you to create an unlimited number of roles, which in turn could essentially allow you to restrict content to be visible by any unique combination of particular users, something which will be very useful for an upcoming family. Hi Kevin. I came here searching for a plugin that will make author’s bio appear on every single post, and to also use the Google snippet. I find this article comprehensive and very useful. Thanks for sharing it to us. Been looking for the right plugin to be used on my blog and voila your choices is just perfect for what I want to use. Thanks for the post, you save me a lot of time scouring the WordPress plugin page. 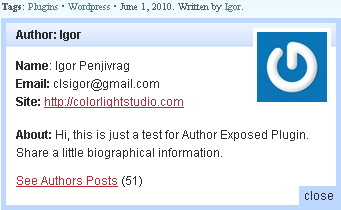 I am using WP status notifier,edit flow and insight plugin for my WordPress blog. Thanks for sharing such informative list for multi author blog. Its a great post. I liked most of the plugins, but mostly the post author plugin. Do you have any suggestions on what I can use to make this happen so that it’s an option when I go to post the new content on their behalf?? Wow, those are some great plugins, I’ll check them all out. Ever come across a plugin for creating custom author profile pages? I found some instructions (http://wphacks.com/how-to-adding-an-author-page-to-your-wordpress-blog/) and they worked OK but the results are barebones and not everything I was looking for. I’m slogging through an attempt to customize, but simply can’t believe there’s no plugin for what has to be a common desire: user description at top of page with posts displayed beneath, just like they’d be displayed on any other page, with thumbnails and meta info, etc. I am in the process of transforming my website into a multi-author effort — and your post is invaluable. I am particularly impressed with the Noupe Theme, which has many elements I’ve been searching for, unsuccessfully. I like the SIZE of the author slug at the top of the article — really shows off the author. And I love the SIZE of the commenter names. I have never come across a theme with similar design features. Is the Noupe theme based on one of the custom theme builders? I am looking for a plugin that allows our writers to select from a library of content they can insert into their pages and posts and then edit. Anyone know of such a plugin please? Wow, I could spend days just playing around with all these plugins. This is perfect for my upcoming project. I’ve been looking for a good bio box, and WP Biographia has the most settings I’ve found so far to get the info and look I want without custom coding. Thanks for suggesting it, works great. One of the best article about the wordpress multi author plugin. Very useful, really helpful for new blog writers like me. Thanks a lot. New to WP and looking for a plugin that can grant access for authors to different pages. This post very helpful, i need users upload, download and view files (any kind of files). Any idea? This is quite a lot but thanks for sharing these useful tools. I am actually looking for something that I can use on my growing blog site with multiple authors. I will try and check which one will be the best for my site. Enjoyed the post. Looking for a multi-user profile plug-in so your information is very helpful! Thank you. This was a very helpful article. Thanks for sharing all these. i am starting a new online magazine at my University using WordPress, and these were all very, very helpful. i love the blog metrics. i can use this to give rewards to top contributor or poster. Nice post! well all the role management plugins cause clashes if you already have some plugins! i tried all but they are not stable or something! Thank you! I was looking for a plugin to show author info at the bottom of every post and WP Biographia saved my day! Thank you! I can’t thank you enough for this article! I’ve been looking for plugins similar to some of the ones listed above for ages! The list of plugins recommended by is really very useful and comprehensive. However, one plugin I was looking for, I just cannot seem to find it. I was looking for something that would block users from posting spam articles. Mine is a multi-author site and as much I want to control spam, I do not want legit authors to go away due to so many entry checks. So I want something that blocks people from posting spam articles by detecting words in title or posts and deleting them at the time of writing or not allow it’s publication at all…..
Is there something like that you cam across with?? or will you help me with the search. I think in current times, it will be very useful plugin for many others as well. Thanks so much for this list! I’ve been searching for months for simple and straightforward solution that would allow me to easily manage and promote multiple blog authors. WP Biographia – this plugin is amazing!!! Wow, I never though WordPress can be this granular when it comes to control! Thanks for this wonderful resource! Great article as we are currently working on an online newspaper for African Youth that will feature many authors and editors… Love these plugins. What do you think of edit flow? Another plugin i didn’t see above. Nice Blog. Saves a lot of time to manually scan for desired plugins and tweaks to build a new site. Thanks again and keep up the good work. Do you have a similar blog for Widgets? This is great. I was looking for how to manage authors on my article directory. I needed to track the top authors and interact with them. Coming to this post of yours is makes my day. A VEEERY BIG THANK YOU! BTW: I am sharing this post on my social media sites for my friends to be aware of it.